ln 2004, a customer is Northwest, Indiana, purchased (4) H50 W-Technologies hydraulic dampers, as part of a turnkey operation to preserve the life and efficiency of a new press. Thirteen years later, in 2017, the customer requested a quote for a complete rebuild due to the normal wear of the seals. The rebuild will restore the dampers to like new condition and will continue to preserve the press life, increase press capacity, and reduce noise. The first step to the rebuild was to disassemble the units. Once the unit was disassembled, the machine components were inspected and cleaned. After all the parts were replaced, new hydraulic oil was added, and the updated hydraulic damper went through charging and testing under pressure to ensure that all the updates are working properly. After using the dampers for 13 years, the dampers were rebuilt to work as if they were brand new. By replacing the dampers, the customers cut the cost to a fraction of what it would have been if they purchased new ones. 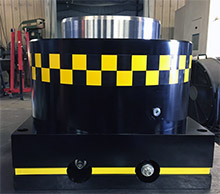 W-Technologies is the only hydraulic shock damper manufacturer who offers a rebuild. W-Technologies, also offers a complete spare parts kit if the customer elects to rebuild the dampers in their own shop.